With the introduction of Wijmo OLAP module, you'll be able to implement high-speed HTML5 pivot charts and tables into your web-based applications. The built-in Excel-like UI and powerful data engine will allow you and your end users to analyze and aggregate raw data easily and meaningfully. When you have a lot of data, it can be difficult to analyze all of the information by looking at it as a plain list of items. Pivot tables can help by summarizing data and allowing you to manipulate it in different ways. Excel has “Pivot Tables” that make this task easy. You select the raw data, click “Insert Pivot Table”, pick a destination, and get a panel where you can drag fields to summarize data in different ways, and instantly see the results. This is one of Excel’s most powerful and popular features. Wijmo OLAP allows your applications to provide the same functionality within your HTML5 applications. Add a PivotPanel control to a page, give it some raw data by setting its dataSource property, and connect a PivotGrid and/or PivotChart controls to see the results. The PivotEngine object is at the core of the Wijmo OLAP module. It takes in the raw data (via its itemsSource property) and summarizes it according to parameters defined in code (including a list of the fields that should be included in the summary and their properties). 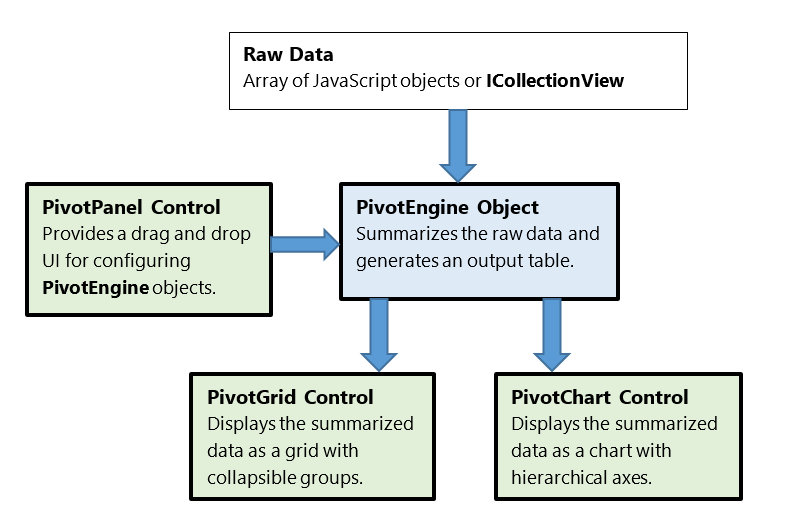 The PivotEngine object is not a control and has no visual representation. The PivotPanel control provides the drag-drop UI used to configure the PivotEngine object. Users can drag fields from the main field list to four “view” lists that represent row, columns, values, and filter. The fields in the “rows” and “columns” lists are sometimes referred to as “dimensions”. Fields in the “values” list are sometimes referred to as “measures”. For convenience, the PivotPanel control creates an internal PivotEngine object that it uses by default so you don’t have to create the engine explicitly. It exposes the engine via its engine property. The PivotGrid control displays the summarized data (view) as a grid, with collapsible row and column groups and a custom context menu that allows users to drill-down into the data represented by each cell, or to configure the view. The PivotGrid control extends the FlexGrid, so it inherits important features such as custom cells and the ability to export the grid to XLSX files. Finally, the PivotChart control displays the summarized data (view) as a chart. It provides hierarchical axes that help convey the view structure, and multiple chart types including column, bar, area, line, scatter, and pie. The PivotChart control contains two controls: a FlexChart and a FlexPie. The inner controls are exposed via the flexChart and flexPie properties. How many product units have we sold? Which countries bought the most units? What are the average units sold or downloaded for each product? What is the quarterly sales trend per product? Question: How many product units have we sold? Answer: Drag the “Product” field into the “Rows” panel and the “Sales” field into the “Values” panel: Product units sold Since the data was randomly generated, we don't see any clear trends here. The sales for all products are very similar in this case. Question: Which countries bought the most copies? Answer: Drag the “Country” field into the “Rows” panel and the “Sales” field into the “Values” panel, then click the grid header to sort the results in descending order: Units grouped by country Notice how easy it is to sort the data: simply click the grid header as you would with a regular flat data grid. Question: What are the average units sold or downloaded for each country? Answer: Drag the “Country” field into the “Rows” panel and the “Sales” and “Downloads” fields into the “Values” panel, then right click the “Sales” and “Downloads” fields and set its “Summary” property to “Average”: Average units downloaded or sold per country As in Excel, you don’t have to drag the fiends into the view lists. You can simply use the checkboxes next to the field names to add or remove them from views with a single click. Notice how the PivotPanel displays the type of summary being used next to each field (in this case, “Avg”). Question: What is the quarterly sales trend per product? Answer: Drag the “Product” field into the “Columns”, the “Date” field into the “Rows” panel, and the “Sales” field into the “Values” panel. Then right-click the “Date” fields and set its “Format” property to “Year Quarter (yyyy "Q"q)”, and set the “Sales” field’s “Show As” property to “% Difference from previous row”: Quarterly sales trend per product Notice how the format used to display the “Date” field affects the grouping and summarization process. In this case, the data is summarized by quarter. Since the data was randomly generated, this example shows no clear trends. The views created by Wijmo OLAP controls are dynamic. The PivotPanel’s itemsSource property is a CollectionView that can be filtered, sorted, modified or refreshed at any time. Whenever a change happens, the views are automatically re-generated. This makes it easy to create dynamic dashboards. All you have to do is load the latest data into the CollectionView being used as an itemsSource and all PivotGrid and PivotChart controls will be automatically updated.